Most pet cats today live indoors most or all of the time. In urban areas, especially, it can be quite dangerous for cats to wander the streets. Consequently, most of us have to find ways to make our homes “cat-friendly.” Veterinarians and behavior experts say that it’s important for a cat’s physical health and emotional well-being to feel comfortable in the home. That means that we have to address the cat’s environmental needs: HERE. These needs include the cat’s desire to be alone at times, to “perch” or take up a high position so they can see everything, and even to hide sometimes. One way to provide for these needs is by giving your cat a good cat tree. Here are our picks for the best cat trees for large cats. Large cats, in particular, can benefit from the exercise that comes with climbing and jumping up on cat trees. Even large cats can enjoy some kitty olympics! It doesn’t matter if your big cat likes to sleep. With a cat tree, curiosity usually wins out and your cat can’t keep from exploring and climbing to the highest perch. If you have more than one cat, a cat tree can allow your cats to separate and have some time apart from each other. Having a cat tree is a good way to help avoid a fight. According to cat experts, a dominant cat will often take a position on the higher perch on the cat tree, showing that she has a higher social position than another cat. She has established her position without any need for the two cats to fight in the house. If one of your cats is timid around people, a cat tree can be a good place for your cat to perch. She doesn’t have to come down when strangers visit but she can stay in the room to observe. Some cat trees have hollowed out spaces so a cat can hide, which cats like to do sometimes. It gives them a sense of safety and peace. They can watch without being seen. Cat trees can also be very helpful if you have a dog in the house. If a dog is being annoying, your cat can retreat to safety high above the dog’s head on a perch! Humans look at the world horizontally but cats are different. They see the world vertically. Your cat looks at things and knows that she can go UP! Cat trees allow your cat the opportunity to climb and perch so she can monitor everything. Cats like to be above it all, both literally and figuratively. Many cat trees are also covered with material that makes them a good scratching post. Your cat can sharpen her claws without using your expensive furniture. Sisal is a good material that is often used to cover the posts on a cat tree. The bottom line: Cat trees can enrich and enliven any cat’s life. If you have a large cat you should look for a cat tree that has perches that are large enough to support her. Many cats like a perch that has some back support so they can lean up against them. If you have more than one cat it’s a good idea to look for a cat tree that has multiple perches. Make sure the entire cat tree is sturdy. It shouldn’t wobble since this will make your cat feel insecure and she will stop using the tree. The tree should have a good base and be made of good materials. The tree should be tall enough to please your adult cat. On the other hand, the tree doesn’t have to be so big that it will dominate an entire room. Many cat trees are beige since this is a neutral color and it fits into most homes. 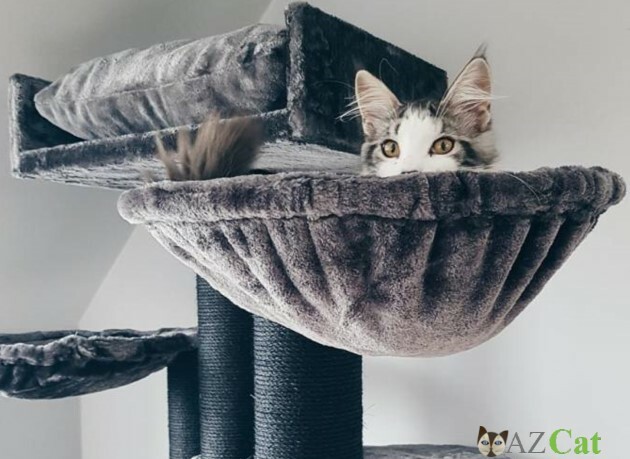 If you have a preference for another color you can often find the same cat tree in a different color such as black, gray, or brown. You can decide whether you want your cat’s tree to include things like condos, baskets, hammocks, ladders, and other extras. These can be fun features for your cat. Some cats like to sleep in kitty condos but if they are included you should make sure they will be large enough for your adult cat. Some condos are small enough for kittens to sleep and play in but they may not be big enough for large adult cats. Some cats enjoy sleeping in baskets and hammocks so if your cat likes to sleep in things that swing you can look for these features. Scratching posts are an important feature in most cat trees. Look for a tree that has posts with a good material so your cat can scratch and sharpen her claws. Sisal – a material used for making ropes and rugs – is a good choice. Go Pet Club 72” High Cat Tree Condo is enormously popular with more than 5000 customer reviews on Amazon.com. It’s 72 inches tall at the tallest point. It features three perches, two condos – and two toy mice! It’s perfect for multi-cat homes so your cats can each sit on their own perch. It has lots of room for your cats to play and lounge. All together there are 10 posts covered in sisal rope for your cats to scratch on – so your cats will leave your nice furniture alone. The other covering on the floor and condos is faux fur. The board material is made of compressed wood. It’s easy to assemble with step by step instructions and tools included. 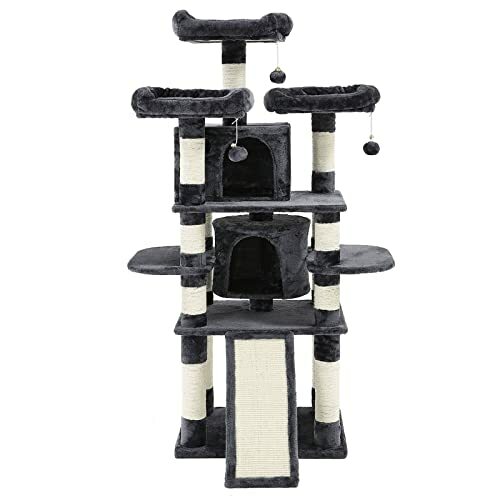 Even fatty cats will love this cat tree and the condos! 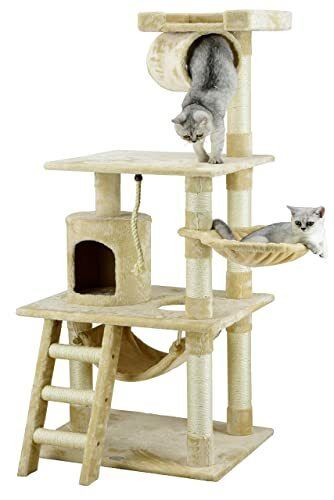 This multi-level cat tree with sisal-covered scratching posts, perches, and condos is really an activity center for cats! Perfect for large cats and multiple cat homes. 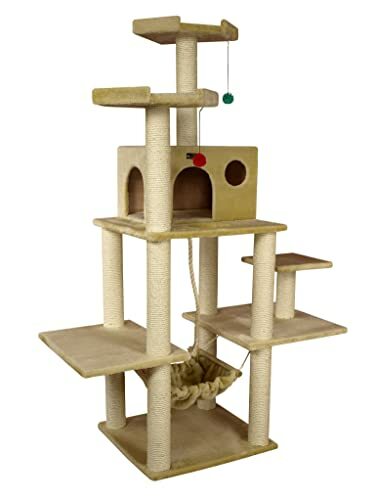 Made by Songmics, the 67” tall cat tree provides your cat with a combination tower and playhouse! With luxurious multiple levels, it has two roomy condos for your cat to nap and hide, plus three perches covered with extra thick soft plush. The ramp/slope is sisal-covered for your cat to scratch. The posts (3.38 inches in diameter) are reinforced and wrapped in natural sisal, too, giving your cat more scratching options. The cat tree is constructed of CARB-certified natural particle boards and strengthened with battens at the bottom to make it extra stable. Fittings are included to ensure the tree won’t topple. Comes with a 30-month warranty and 100 percent satisfaction guaranteed. Size and dimentions: 23.6 x 21.6 x 67 inches ; 60 pounds. Armarkat makes this attractive cat tree/furniture condo. This model is 70 to 75 inches tall but it also comes in other sizes. This is a great unit for anyone with a large cat. It has literally thousands of positive reviews on Amazon.com, many of them from people with larger cats. It’s perfect for scratching, climbing, sleeping, and exercising. The cat tree is made from pressed with and has a faux fur covering. Looks great in any room of your home. Easy to assemble. Comes with an instruction manual, hammock, and the tools needed to put it together. Armarkat brand (part of AeroMark) has been making cat trees and pet beds for the last 20 years. They are well-known for producing reliable quality products with endurance and style. Their cat trees blend with any décor. They have sturdy bases with easy-to-assemble structures. And the company uses only pet-friendly materials. Replacement parts are available if you ever need them. Model No. : A7202; Covering Material: Faux Fur; Covering Color: Beige; Board Material: Pressed Wood; Post Diameter: 3-1/2-inch; Overall Dimensions: 53-inch (L) X 22-inch (W) X 72″(H); Max Holding Weight: 60 lbs. This Go Pet Club Cat Tree/Furniture is 62 inches tall. This model is beige but it also comes in black and brown for the same price. (Amazon can also link you to other sellers who have it in blue for a slightly higher price). The size is 38 inches wide by 27 inches long. It weighs 42 pounds. This cat tree is perfect for cats of all sizes, including large cats. It has several thousand positive reviews on Amazon.com, including good ratings from people with large cats. It has lots of sisal rope on the posts to encourage your cat to scratch. It also has a basket for sleeping; a hammock; a ladder; and a condo; as well as perches. It even has a small tunnel! The unit is made from pressed wood and covered with soft faux fur. It comes with step by step instructions and the tools needed to assemble it. If you want just one simple piece of cat furniture, the Molly and Friends Cradle and Post could be what you need for your large cat. It’s a cradle on top of a 27-inch sisal-wrapped scratching post. The cradle provides a large rest area for any cat, no matter how big! Even if you have a very big kitty – or more than one cat, if she’s willing to share space – there is room to stretch out. Natural thick sisal rope lets your cat dig her claws into the post and scratch. The premium quality cat furniture is made in the U.S.A. No assembly required. The furniture is solidly built. 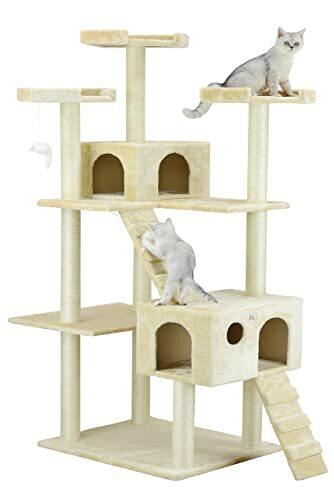 It’s handmade and not “modular.” This is a sturdy, upright post that your cat can climb, scratch, and sleep on top of without fear of it coming apart. This is a real lookout tower for your cat. The tower is made from a solid pine pole and uses heavy duty screws and bolts. This unit stands 34 inches tall on a base that is 18 by 18 inches. Comes in beige. As one pleased customer said, it’s the perfect size to be useful and not take over the room – unlike some very big cat trees. Cat trees can be an important part of a cat’s home environment. With so many cats living indoors a cat tree is a great way for cats to have an opportunity to climb, exercise, sharpen their claws, perch in high places, get away from another cat or dog in the home, and sleep peacefully. All of these things are important for your cat’s emotional and physical health. If you’ve had an unhappy cat you know how their attitude can negatively affect everything in their life, including their physical health. Making your cat’s environment more fun and interesting with a cat tree is an important way to keep her happy and healthy. The best cat trees for large cats will be sturdy and provide good perches. They should also have good posts for scratching. We hope you and your cat like the cat trees we have recommended. These are some awesome cat trees that you’ve selected. As a writer of cat trees myself, naturally, I’m really excited to read this one in particular. The only ones I would disagree on are the Go Pet Club Trees. They can not sustain a large cat, especially during play. Love Molly and Friends too but they go out of stock fast so if anyone is looking to buy one, never wait for later. Get them while they’re available. Thanks for the amazingly comprehensive post. Our cat is really lonely at the moment constantly looking outside and meowing. I think one of these trees could be a big help, as she seems bored of her basket, tent and usual places she likes to curl up in. A nice selection. 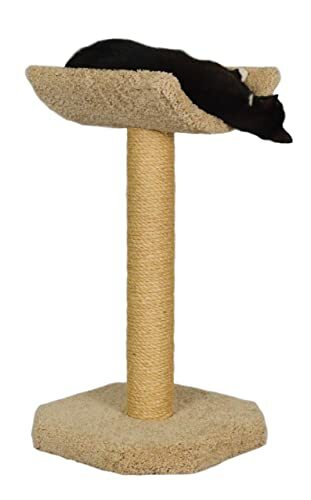 Although, if you have a particularly large cat I would recommend cat trees that have a sisal post diameter of a minimum 12 cm and of course they must be made from wood and not cardboard!